Sunrising is a beautifully positioned property on the banks of the Fal Estuary in Cornwall which has been completely remodeled and offers generous interiors, all of which make the most of the views out over the Restronguet Creek and across to the Roseland Peninsular. Inside, the property has a large drawing room/dining room with full height windows and the kitchen is solid ash and has an oil-fired Aga. Upstairs, four bedrooms each have en-suite bathrooms – the master bedroom also has access to a lovely terrace, while the second bedroom has a small terrace/balcony. Outside, behind the house are terraced gardens including a large decked terrace. The double garage has a useful studio above, while the boathouse has been recently rebuilt with a decked area sliding into the water. The house has over 200′ of water frontage; a slipway comes out from the boathouse and there is a small quay and two moorings, one deep water, which may well be transferable. 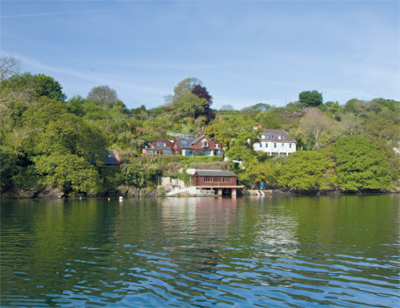 Sunrising is located just five miles from Falmouth and its excellent local services. This part of South Cornwall is well-known for its wonderful sailing and cruising, especially with the Helford Estuary extremely close by. Truro is nine miles for rail services to London. The guide price is £1.75m. For further information please contact Knight Frank on 01392 848 842 or visit http://search.knightfrank.com.